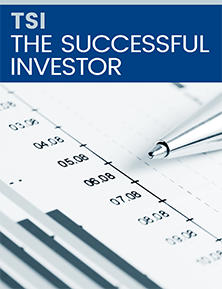 Keep your portfolio on track with Pat McKeough’s strong conservative stock picks in TSI The Successful Investor. Renew now at your discounted price AND get a special bonus. Keep receiving digital delivery of your issues—and the weekly Email Hotlines, a full library of back issues, and more. Plus as an MDJ reader, you will also receive 3 free months of TSI Stock Pickers Digest, our special advisory that uncovers rising stocks for more aggressive investing. Receive PRINT + Digital delivery of your issues—and the weekly Email Hotlines, a full library of back issues, and more. Plus as an MDJ reader, you will also receive 3 free months of TSI Stock Pickers Digest, our special advisory that uncovers rising stocks for more aggressive investing.